At Mark Weitzman D.D.S., we strive to provide the best dental services to each patient who visits our office. We want you to look forward to coming back for future visits. The environment that we provide at our office is one that welcomes you and our staff aims to make you comfortable and relaxed. 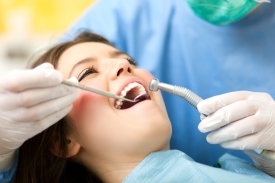 We don't want dentist visits to be a dreaded experience, we make your services as painless as possible. Over the years, when patients come to our office, they become patients for years. We want you to be one of those patients. On top of this, Dr. Weitzman himself has been recognized for his services. He has been rated the Top Dentist in Ventura County for two years. He is also a master ceramist providing top-notch cosmetic dentistry services to those in Beverly Hills and surrounding areas. Get the results you want, call (805) 295-8896 now. We consider our office to be a one-stop shop for any dental needs that you and your family may have. When it comes to family dentistry, we are dedicated to helping your children's teeth stay healthy and clean. For your cosmetic dentistry needs, you can rest assured that our services are of the highest-quality. Dr. Weitzman has helped countless clients get the smile they have always wanted. Of course, we also handle any cleanings and whitening that you may need. We truly care about your dental care and our materials and techniques are the most advanced. Let us be your family dentist, give us a call now to get started with an appointment. We serve the areas of Thousand Oaks, Los Angeles, Ojai, Oxnard, Beverly Hills and all of Ventura County.